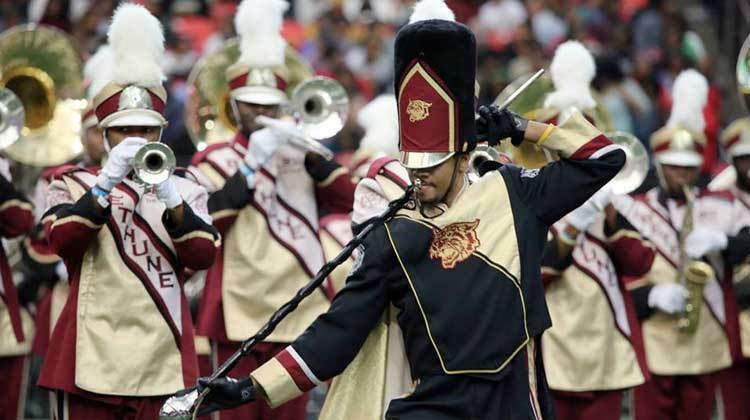 2018 HONDA BATTLE OF THE BANDS: Performance Analysis & Rankings – Block Us Up! OPENING/DRILL – Lines remained straight as the band marched onto the field. The fanfare was well played, balanced, and powerful. The formation looked great. Great song selection on the opener. The band’s sound was consistent from the fanfare through the drill, great job. Formations look good however there are a few spacing issues across the band. Having the flags down front added a nice visual on the chorus. FLAG FEATURE – Great precision ladies! The rotine was well choreographed as well. I noticed a nice mix of technical difficulty and visual entertainment. The band remained consistent on the sound, great job! DRILL – Another great song choice. “Master Blaster” is a long time favorite. It is also a difficult piece to pull off with over 200 musicians playing those runs. You executed well. BALLAD – Great Sound here! I really enjoyed your lower brass. Very well written arrangement. I could tell it was written specifically for this band. I appreciated the modulation and the beautifully played ending. Kudos to all! DANCE FEATURE – Very classy look, loved the uniforms. Technique and style defined this group. I was very impressed. The white gloves added just a touch of something extra that excentuated their every move. Great overall execution. The band continued to play well. DANCE ROUTINE/EXIT – This band played very well… However dancing was not its strongest attribute. Many of the movements came off as stiff and mechanical. The difficulty level of the dance routine was very low. At this point, you lost the attention of the crowd. The sideline blowdown was my favorite part of your dance routine/exit. The audience seemed to get back into your performance at that point as well. I appreciated the fact that you kept your instruments off the ground during the dance routine. Good job. OPENING/DRILL – DMs looked great. I liked how the band displayed a lot of tradition throughout your performance. However the new fanfare was a welcomed change. I hope you keep this opener in the book. “ASU” looked great floating down the field. I wasn’t sure what the next formation was. Could be a spaceship? I appreciated the attempt at animation but it would have been better received if a narrator pointed out what it was supposed to be. However, I like how you are stepping outside of your box and trying new things. Great job. The “ATL” formation was good, however the marching style is not well defined across the band. BALLAD – Great dynamic contrast! I loved the lowerbrass sound here. The auxiliary did a great job upfront. Not a bad arrangement of “Who can I run to?” I appreciated the musical approach to today’s performance ASU, great job! DANCE FEATURE – Great, strong sound. Uniformed look on all the dancers, very classy. I was very impressed. The routine showed technique and style with great transitions. Loved the entrance and exit. DANCE ROUTINE/EXIT – Started with big energy then went into maneuvers that appeared to be “standing movements” (No knee bend) The Honeybees were great. I was particularly impressed with the young lady who did a “V-kick”. However most of the routine was not very technical, but it was well choreographed. The audience loved every moment of it so the routine was effective. Great job band! OPENING/DRILL – Impeccable display of uniformity and precision. “Players Anthem” was very balanced and sounded great. The DMs were perfectly synchronized with each other, it was impressive to see. Each band member was also perfectly synchronized. The band looked like an army marching into battle as it took the field. The “BCU” formation and float maneuver was well executed. Nice sound throughout the drill, each tune was well executed. The TTRs were well executed across the band. The Georgia Peach logo was well executed but the letters could have been expanded a lil more to make the words easier to read. DANCE FEATURE – Loved the look ladies! It was a uniformed look across all dancers. The routine was well executed and powerfully done. The band’s arrangement could have been better. The ending was uneventful and unexpected which resulted in a lackluster applause from the audience for what was a well executed routine. BALLAD – Great control lower brass! I really appreciated the modulation as well. It was a very nice arrangement, but did not push the envelope or expose the band to challenges. The coda was well executed. DANCE ROUTINE/EXIT – This was a typical Cookman dance routine. Well executed, energetic, precise, but expected. I enjoyed the money bag formation and selection during the “2nd ending” but it was good they did it because there was crickets at the end of the 1st one. Great showing wildcats! OPENING/DRILL – Pinwheels were not well executed as the band marched into the opening position. The kaleidoscope drill was well done and a great visual. The girls walking through the band provided a great splash of color that I appreciated. Great show planning! Fanfare sounded great. The band was balanced and, based on the size of the group, I can tell everyone was contributing. Good execution of the marching style but the letters “HU” were not properly aligned. The “VA” formation was executed better. The sound remained consistent. The DM routines were nicely done and appreciated by the audience. The auxiliary down front was a nice addition as well. The rotation of “VA” had issues. Started out well but lines got wavy the more it moved. The marching transitions during the percussion feature was a nice touch. DANCE FEATURE – It was hard to tell what the uniform looked like from the stands. The colors seemed to mesh together from that distance, looking like a splatter of paint. The routine seemed rushed and not well synced with the music. Almost like if the routine was created without hearing the music. A few young ladies struggled through the entire routine and the ending was sloppy. However, this is the best I’ve seen from this group and the high level of technical difficulty was appreciated. Love the way you are raising the bar across the program. BALLAD – The ballad was well played. I was not familiar with a few of the songs, but it sounded good which is impressive. If the Drum Line is going to move during the ballad you should make sure all the moves are the same. The band sounds great, but it all seems to be at one volume. A change in dynamics would have kept the audience’s attention better. Flags up front looked great. Great routine. I like how you are utilizing the auxiliary unit model as opposed to dancers, flags, majorettes, etc. DANCE ROUTINE/EXIT – Dance routine was effective. Having the auxiliary up front really helped in selling the dances. The sideline blow down was effective and the audience showed their appreciation for your performance. Great job and congratulations on a successful first showing. OPENING/DRILL – DMs were very exciting! Big, strong sound on “Neva Scared”. Knee lifts were consistent across the band. The formations were clean, but there were a few crooked lines on the big “M” formation. Dance moves in the big “M” formation weren’t as well rehearsed as the big intro. Great sound on the drill tune! DANCE FEATURE – Exciting performance! The uniforms were not visually appealing to me. The tail on the back of the uniform added no benefit to the performance. Several dancers were not “finishing” the maneuvers. The choreography was simple and missing technical elements. DRILL -Great sound on “My Perogative!” I was there for the shade thrown at Honda for the years of not being invited as a SIAC marching band. I agree that you, Miles, should have been invited many years ago. The marching style was not consistent during the transition into the ballad. BALLAD – There was a lot of wasted time waiting on the audience to stand; the energy of the show was lost during this pause. The lead singer was very soulful, but she experienced some pitch issues. Maybe she couldn’t adequately hear herself during the soft keyboard section of the song. Great overall sound; the band was playing well behind the choir! I would have cut the arrangement to one verse on both songs, to save time as the ballad got long. There was not much going on visually here. Some lyrical dancing or a change in flags would have elevated the performance. The choir performed well. Walking off the field is never a good way to end a show. Marching off the field with a sideline-blowdown of something gospel would have put an exclamation on the end of a good performance. Good job, Miles. OPENING/DRILL – Nice formations! I loved the arrangement of “We Are the Champions!” Several lines were not straight. Overall, the drill was well executed, but not very challenging. The “A&T” formation looked great and was very effective with the well-timed narration from the announcer! DRUMLINE –There seemed to be a lot of running around. Overall, it was not received as well as Prairie View’s feature. With better narration, your announcer could have helped the audience understand the concept better. DANCE FEATURE –The dancers looked great, as usual! The band sounded great here, as well. The ribbon prop wasn’t necessary, as it didn’t assist with the theme of the performance. However, the choreography possessed great technique mixed with style. Golden Delight was one of the best dance teams of the day. BALLAD – “Be Ever Wonderful” was well-written and well-executed. The tubas needed to be brought down below the staff in some spots, but overall great execution. I appreciated the accuracy of the initial melodic line. The contrast in dynamics was applied where and when it was needed. DANCE ROUTINE/EXIT – Great energy and execution of the music was good. Song selection was good for the dance routine. The “Wall of Sound” exit was effective. OPENING/DRILL – The DM’s had a great routine that was well executed! The “V” formation was a little wavy. Great arrangements on the drill. The “NYC” formation could use some work. People were not guiding down the lines. The “Bee” formation was nice with the moving inner lines. The band had a powerful sound! I am not a fan of the scattered drill formation. It would be a great effect to “snap” into the “Storm” formation from short, straight lines. The lines would serve as a guide and point of reference for the curves of the “Storm” formation. BALLAD/FLAG FEATURE – The selection was well played, but could have used more dynamic contrast. The volume started at a high level and stayed there. The “Astro” formation was nice, but spacing was off in some areas. Great performance from the flags! They were technical and entertaining, at the same time! DANCE FEATURE – Great technique displayed throughout the entire routine! The first performance was short and the second one, even shorter. The uniforms were much better during the second performance. The circle formation into a drop roll was very nice. Synchronization was off during the second routine, but overall it was better than the first. DRUMLINE- I appreciated the theatrics. You displayed a good understanding of the crowd you were performing for and you did not disappoint by getting out there and “chopping it up.” Smart move! DANCE ROUTINE/EXIT – Great energy! Strong sound! You kept the crowd into the routine for the entire performance! Big sound on the sideline blowdown which made for a strong finish. Great way to cap off a successful year! OPENING/DRILL – Great opening drill! The band sounded great! The sound was balanced and aggressive! The formations were designed and executed well. The overall sound was full and balanced. The pinwheels were wavy, instead of being straight. The “Oprah” formation was well executed! Great narration and song selection. DANCE FEATURE – Wow! Uniforms were nice and classy! Routines were well-choreographed. Transitions were intriguing and added layers to the routine. First class performance! DANCE ROUTINE/EXIT – The announcer positively contributed to the show! I loved the shade on “#FACTS!” The band was crunk and the crowd loved it!! Great job TSU!